Several girls were considered for this prestigious award. Aspects that were looked at included player activity at Club, County, Regional and National levels; a commitment to player development, participation in both individual and team events, and evidence of achievement. It is only right that we acknowledge Lily Humphreys (Stoke by Nayland) who is still an Essex Junior but she has now moved on to the higher levels of the sport including winning the 2018 Helen Holm Scottish Womens’ Amateur Championship, representing GB&I in the Curtis Cup and representing Great Britain in the recent Youth Olympics in Buenos Aires. We follow her progress with interest and delight and wish her well for the future. We would also like to highly commend Ashley Chalmers (Thorndon Park) who has had a very successful year both for County and Club and has been selected once again for England training. She has played in numerous tournaments throughout the U.K. this year including the Helen Holm Scottish Womens’ Amateur Championship, WPGA Amateur Medal, Astor Salver, English Girls’ Open Amateur Championship, Liphook Scratch, East Region Ladies Championship, and Essex Schools Championship. Ashley also continues to play regularly in qualifying competitions at her home club and represents Essex in both the County Team and Junior County Team. We congratulate her on her achievements this year. Overall it is encouraging the level of commitment that is being shown by the girls and the time and effort given to participating in the game. In the end it became clear that one stood out amongst all others – Sophie Wheeler (Thorndon Park). Played in the Comboy Scratch, Hampshire Rose, English Women’s Amateur Championship, English Girls U16 Open Amateur, Qualified for the National Schools Championship, competed in 11 qualifying competitions at her home club, as well as playing in East Region and County Girls events. And is studying at the South Essex College Golf Academy (the only fully funded golf and education course in South East England). For a second year running Sophie Wheeler (Thorndon Park) is Junior Golfer of the Year. 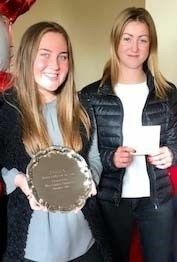 Sophie Wheeler (Thorndon Park) 2018 Junior Golfer of the Year with Ashley Chalmers (Thorndon Park) Winner of Best Gross Prize at the Autumn Meeting and Highly Commended for the Junior Golfer of the Year Award.